Pietropola, Kramer named Athletes of the Year. Hornets fall to Warrior Run in playoffs. Prough, Levindoski named to NTL All-Star team. Three home runs power Hornets past CV. Hornets fall to Athens, 12-2. Hornet baseball falls to Sayre, 12-1. Hornet baseball tops Canton, 4-3. Hornet baseball tops Wyalusing, 7-5. Hornets defeat Mansfield in extra innings. Hornet baseball tops Troy, 9-8. Doty homers, Hornet baseball falls to Towanda. JV baseball, softball top Williamson. JV baseball drops double header to NEB. Hornets and NEB game suspended. JV Baseball splits with Canton. 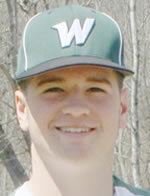 Waverly baseball rallies past Towanda.